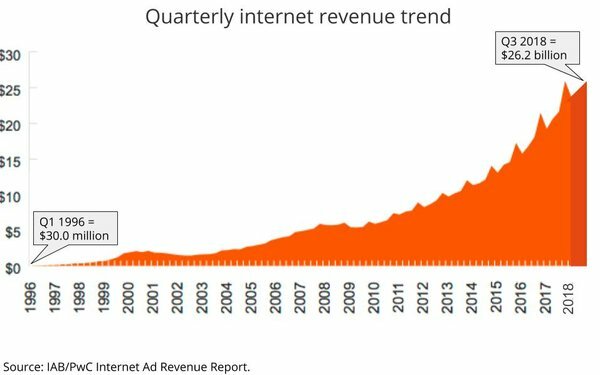 According to the Interactive Advertising Bureau’s latest Internet Advertising Revenue Report, digital ad revenue was $26.2 billion in the third quarter of 2018 -- up a whopping 22% compared to the same quarter a year prior. The report, which was prepared by PwC U.S., found marketers spent a total of $75.8 billion over the first three quarters of 2018. With that explosive growth, the first three quarters of 2018 were the highest-spending on record. The data suggests that 2018 will be the biggest year yet for digital advertising revenue and spend. Relatively new players in the digital advertising space helped propel the overall market to that record number, according to Sue Hogan, senior vice president of research and measurement for the IAB. “Last year saw significant growth in the OTT marketplace and in the direct-to-consumer brand ecosystem — contributing factors in digital’s successful Q3,” Hogan said in a statement. The IAB Internet Advertising Revenue Report is based on a survey of the very largest companies, with their response projected to the overall market based on historical comps. PwC and the IAB update the figures for its half-year and full-year reports.